Hello everyone. This weekend Peter and I have been very busy on our yard. I will upload some picture next week. By the time we finished today, it was too dark to take pictures. We are in the process of installing a barrier for our bamboo. I have most of the trench dug. We will need to finish that, but there is some structure that needs to be removed first. I'm planning on doing that next weekend. Luckily we are putting in the barrier now. If we had waited any longer it would have been a much harder project. Bamboo amazes me how fast it spreads and grows. Also, we went to the Clark County Home Garden and Idea fair, and that was a ton of fun. We were able to get almost all of the vegetables we are going to grow this year, and a number of other wonderful flowers and plants. Everything is really making our yard come together. I took a lap around our yard this evening, and it's becoming a little paradise. Last weekend we took my parents up to Tsugawa Nursery for my Mom's birthday and she picked out a very nice shrub that I'm very curious about because of the bloom the tag described. I will have to check back with her in a few weeks to see how it is growing. It looked almost like a boxwood, but it said it had blue blooms. Very interesting. Peter and I also got some plants on that trip as well including a new rose for me call Koko Loco. I can't wait to see the blooms. They start as a creamy white and go violet. If it looks like the pictures I've seen It will be a wonderful addition to my rose garden. I wish I had another day to recover. It has been a lot of hard work. I'm also getting some ideas together for my Koi pond. That will finish off the back yard when it is finished. It will include the pond itself, a stream, a garden studio, and a greenhouse. I know huge project, but we will be able to do it in small more manageable parts. I will have pictures as we go along. All and all a great weekend, and I'm looking forward to next weekend. Hope everyone had a weekend as fun as me. Every year I write down my goals. This year I have 7 goals, but my favorite one is to draw as much as possible. 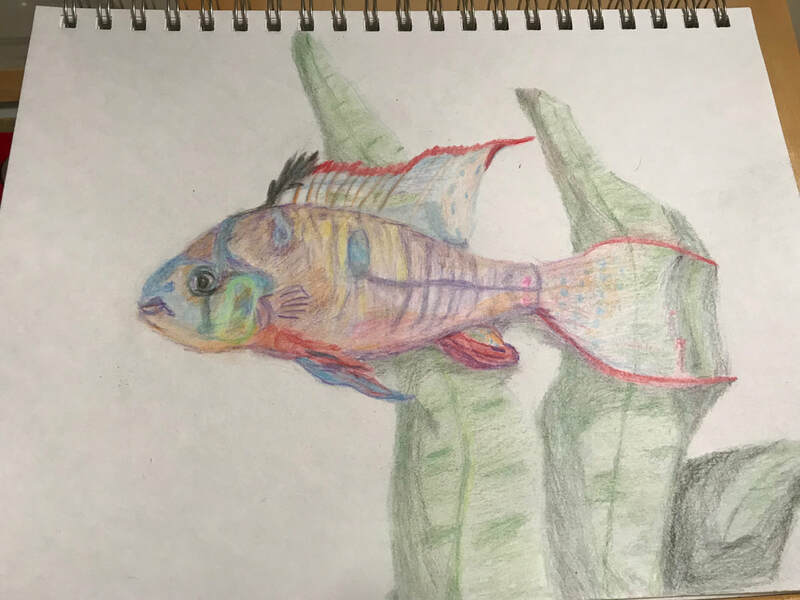 So, I thought I would share my first drawing of the year. I still have some to do on it, but here it is. Peter and I have decided to redo our office. We found doors at the Habitat for Humanity Re-store, and we got legs from Ikea. I've decided to cover the doors with suiting fabric, and edge the doors with copper sheeting. I will post some pictures when they are done. We have them built, but we still still need to do the covering. We found the doors for an amazing price at $2.50 a door. I can't believe we got them so cheep. Since we did get the basic parts so inexpensively it allows us to do some really fun stuff with the finishes. I can't wait to see how they turn out. The new desks will give both of us a lot more space to work. I'm hoping that I will be more inspired to do my artwork. I would like to get back into that. My art is mostly used for stress relief, but I also sell it on various things at redbubble.com. I've sold a couple items, and I'm getting more ideas. Wonderful evening tonight. 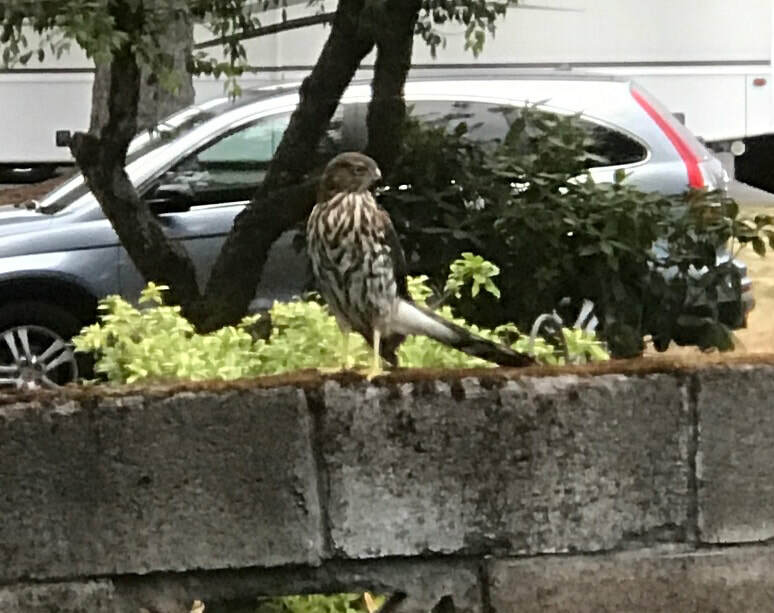 We were able to watch as a hawk hunted in our yard. What a beautiful bird. He sat on our fence for quite some time before a mouse came out from under a leaf, and he swooped down and got it. It was just like a nature show. I was able to snap a picture with my phone before he flew away. Hello everyone. had a wonderful weekend. Peter and I were able to get a lot done with our yard. We have started to finish our side yard. I will post some pictures when we are further along. We are in the process of getting rid of the grass, and doing a rock garden. Peter was able to rototill the grass, and we got a good chunk of the weed barrier down. I will love the lower maintenance on that side, and it will look great with river rock in place, and Crape Myrtle. The Myrtle trees are small right now, but should grow up to be beautiful trees with crimson flowers. Also we plan to integrate some nice ground cover. I can't wait to get it finished. While Peter was working on the side, I spent some time weeding, and pruning up some of the bushes. I also spent some time trimming up my roses. One of them was so laden with flowers that a lot of the branches were bent all the way to the ground. 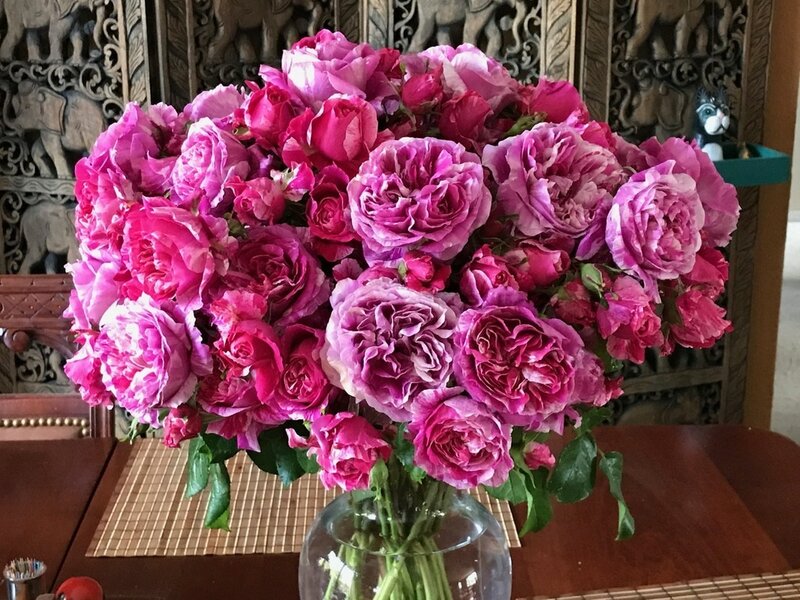 So, I trimmed that rose way back and made a bouquet. Here is a picture. I hope the rest of my roses do as well as this one has. I'm hoping to be a little less lax on posting to my blog. Until next time thank for listening. I think it is time for me to tell everyone who I am. As of this date that I'm writing this I'm a 42 year old, gay man living in Gresham, Oregon. I would be considered to be lower middle class, and I live in a hard working, Blue Collar neighborhood. I've been blessed in many ways. I've grew up in a stable family, with parents that have loved me unconditionally over my 42 year. My parents wonderful marriage has been a guide for my relationship with my husband for the last 15 years. I have a brilliant sister who has been my friend all of my life. For the past 15 years, I have also had the wonderful influence of my mother and father and brother in-law there families. They have also been wonderful roll models, and great friends. My extended family is a loving, caring bunch, that has been a rock of stability for me, even with all our varied ideas of politics, religion, and life in general. The times that we have come together through the years have been joyous, and we have always tried to respect our differences. For that, I'm proud to have the family that I do, and I deeply miss the one that we have lost. Now for a little background of were I've lived. The Portland Metro area has been my home for most of my life, but for almost 6 years, from late 2006 to mid 2012 I had the great pleasure to live in Chicago, Illinois. During that time I was able to experience culture that I never would have in Portland. Not because Portland doesn't have a lot to offer, but because when we are native to a certain place we tend to get too focused to the life at hand. I needed to be moved away from my comfort zone in order to experience it. The experience didn't change my life views, but it did open my eyes to new possiblities, and a broader view of the country. The NW will always be my true home though. I feel the most grounded here, and I need that ground in order to thrive mentally and spirtually. Over the next couple of posts I would like to get more in depth of who I am, but it's going to take some more thought. Also, I would like to get into my politics. This last election has been very hard, and in ways has been deeply troubling for me, as I think it has been for most of the nation. Until then, thank you for your time reading this. To my family, I love and resect you very much, and I'm proud to be one of your people.